It would appear as though this storm has peaked out at about 9,000 foot snow elevation. That is now starting to come down and it will plummet to a mixture around 5,000-6,000 feet. That means this is a massive snow storm above 8,000 feet. Again, most other weather outlets can tell you about the flooding, so I will not waste your time here. This storm will finally wind down around 2:00 tomorrow afternoon. Then, 8 hours later the next storm arrives with much colder air. This next storm will tap into a very wet Pacific moisture plume and deliver more large amounts of snow. This storm will wind down on Thursday afternoon after dumping several feet of snow throughout the Sierra, starting at about Lake Level (6,300 feet). After this storm moves on, we foresee about a 4-5 day dry period before another very impressive storm moves in early on Tuesday the 17th of January. The peak of the next storm should hit us Tuesday afternoon and last a good 24 hours. Then several more waves will hit and deliver even more snow. When all is said and done, we see another 8-15 feet of additional snow between now and next Friday, above 8,000 feet. As far as the Carson Range and Mt. Rose, I fully expect an additional 8-12 feet of snow, above 8,000 feet. There is very little shadowing effect and by the time we hit our break on Thursday, our January total could well be near 25 feet of snow. As snow levels plummet, the rain will change to snow, not just in the mountains but especially the foothills and then eventually all the way down to the valley floor. With the rain, all the snow is gone from the last storm, but we are going to get cold enough. 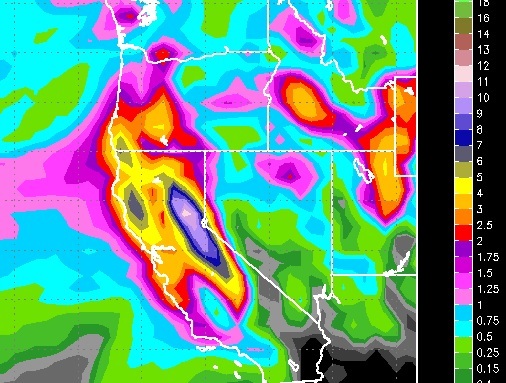 I expect 6-12 inches of snow on the valley floor by next Thursday and double that in the foothills above 5,500 feet.